Releases from the Aspinall Unit will be decreased by 75 cfs on Sunday, September 9th. Releases are being decreased in order to bring flows in the lower Gunnison River closer to the baseflow target while conserving storage in Blue Mesa Reservoir. 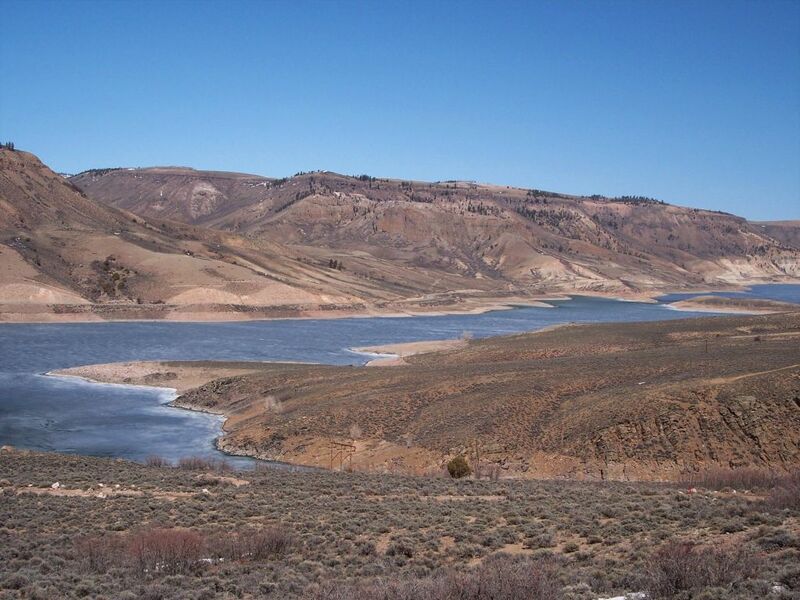 The actual April-July runoff volume for Blue Mesa Reservoir was 237,500 AF of inflow, which is 35% of average. Flows in the lower Gunnison River are currently above the baseflow target of 890 cfs. River flows are expected to stay above the baseflow target for the foreseeable future. Pursuant to the Aspinall Unit Operations Record of Decision (ROD), the baseflow target in the lower Gunnison River, as measured at the Whitewater gage, is 890 cfs for September. Currently, diversions into the Gunnison Tunnel are 1000 cfs and flows in the Gunnison River through the Black Canyon are around 575 cfs. After this release change Gunnison Tunnel diversions will still be 1000 cfs and flows in the Gunnison River through the Black Canyon will be around 500 cfs. A recent ruling could settle the unresolved groundwater rights of nearly 240 tribes. The Agua Caliente Band of Cahuilla Indians, in California’s dry Coachella Valley, relies on a rapidly dropping aquifer. In 2013, the tribe sued the Coachella Valley Water District to halt its groundwater pumping. Four years later, the U.S. 9th Circuit Court of Appeals ruled that the tribe has priority rights to groundwater beneath its land — a precedent-setting decision (“A tribe wins rights to contested groundwater in court,” HCN, 4/5/17). An August study published in Science clarified how much groundwater could be at stake. 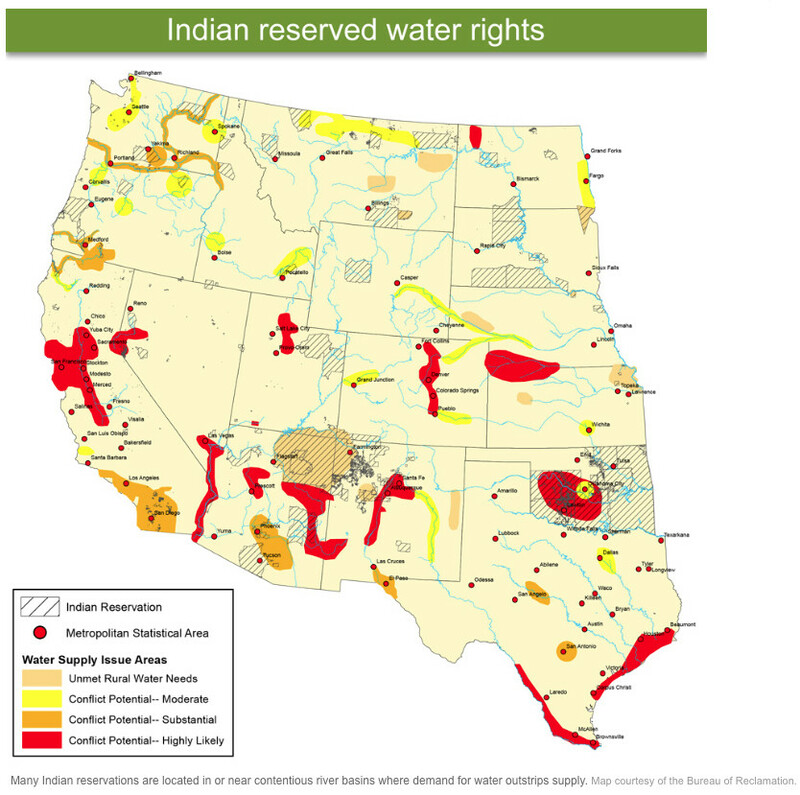 Nearly 240 Western tribes have unresolved groundwater rights, largely in Arizona, Oklahoma, South Dakota and Utah. The Stanford University study also noted, “This ruling establishes a new standard throughout nine Western states within the (9th circuit) court’s jurisdiction.” As water supplies dwindle with climate change and serious conflicts arise with other users, tribes will have major leverage in determining how Western water is allocated. 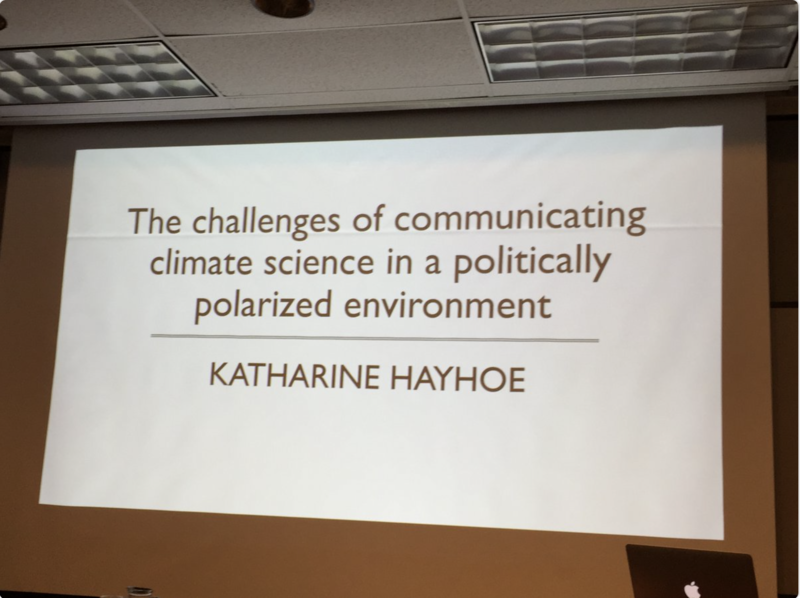 Yesterday afternoon Dr. Katharine Hayhoe gave a presentation about communication as one of CIRES Distiguished Lecturer Series. It was a real treat for me since I had never had the opportunity to see her in person and she is one of my heroes in the climate change world. 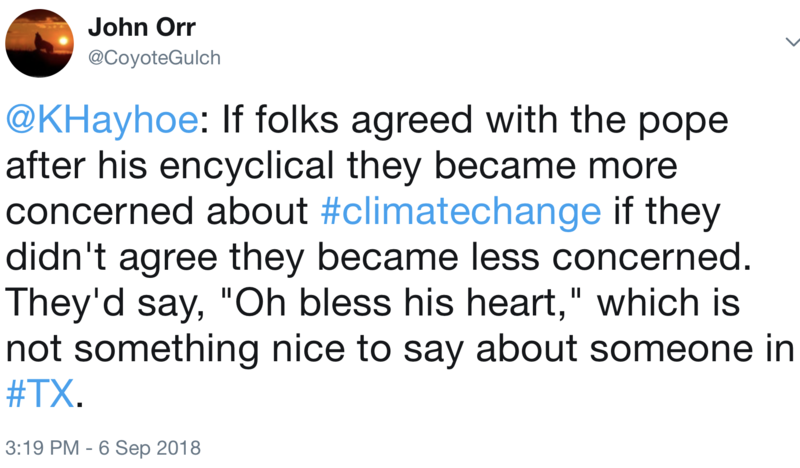 She is one of Coyote Gulch’s favorite climate science communicators. Her series with PBS, Global Weirding, takes on the myths and arguments against the reality of climate change in a clear and understandable way. I’m in the water business and we are very worried about the fact that stationarity is dead. Stationarity can be characterized by the statement, “The past predicts the future,” but when the water cycle is changing due to global warming there is uncertainty about using historical hydrological data to predict future streamflow. We’re seeing the effects of higher temperatures on snowpack and runoff here in the West. She lives in west Texas where there is a lot of flat land and open spaces. It’s possible to drive down the highway and steer your car by keeping the road in view by looking in your rear view mirror. Problems arise when the road has a turn in it. You are likely to crash if you haven’t been looking ahead of you. She detailed some of the experiences that helped shape her approach to climate education, from the very first lecture, full of charts and graphs and detail, when, at the end, she called on a questioner, and he said, “Are you a Democrat?” She learned from subsequent speaking engagements that it was very hard or impossible to connect with a majority of folks by presenting the data. 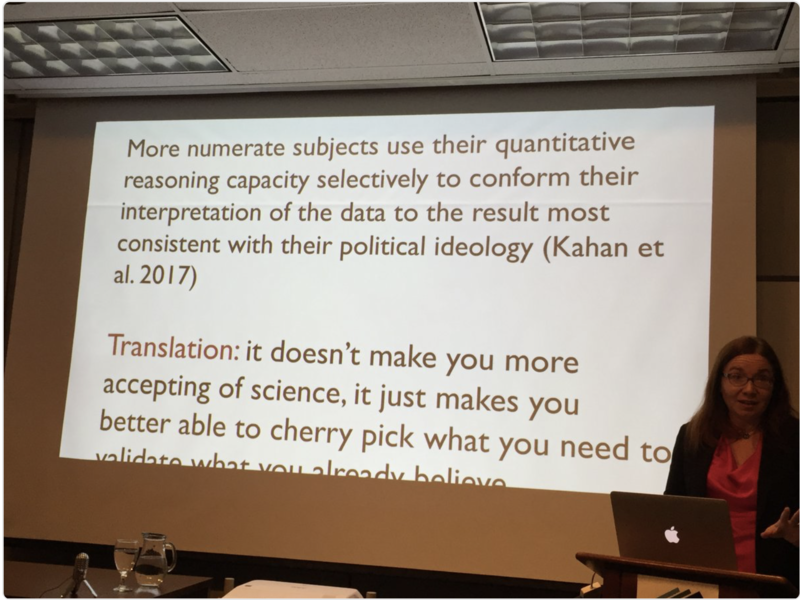 She also showed a series of slides that tracked climate change views by political affiliation which clearly illustrated the divide in the U.S. in 2018. Dr. Hayhoe is an accomplished speaker telling stories and using humor to make a point. 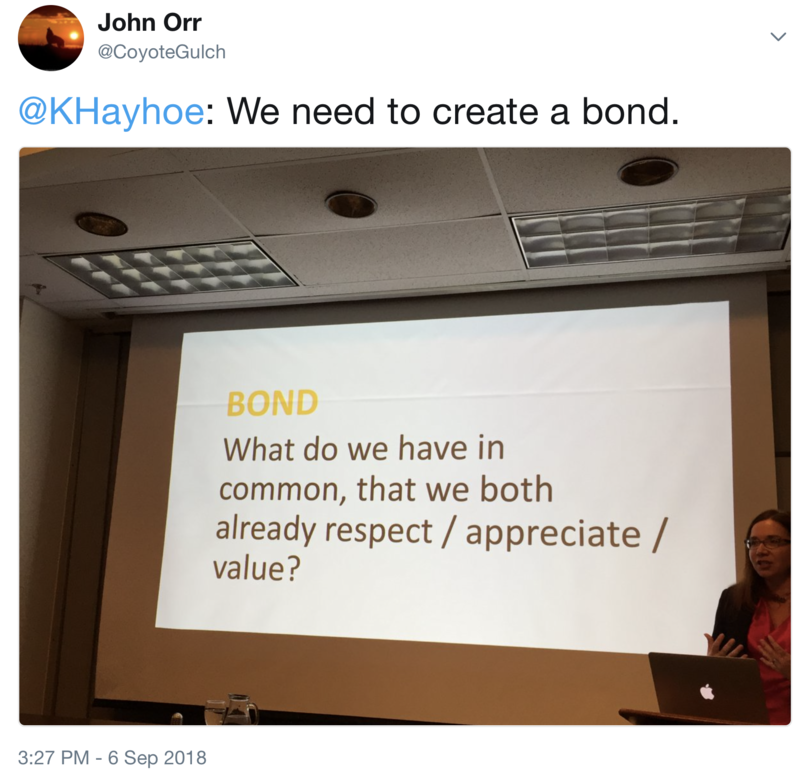 The first step in communicating, she says, is to create a bond with the audience. 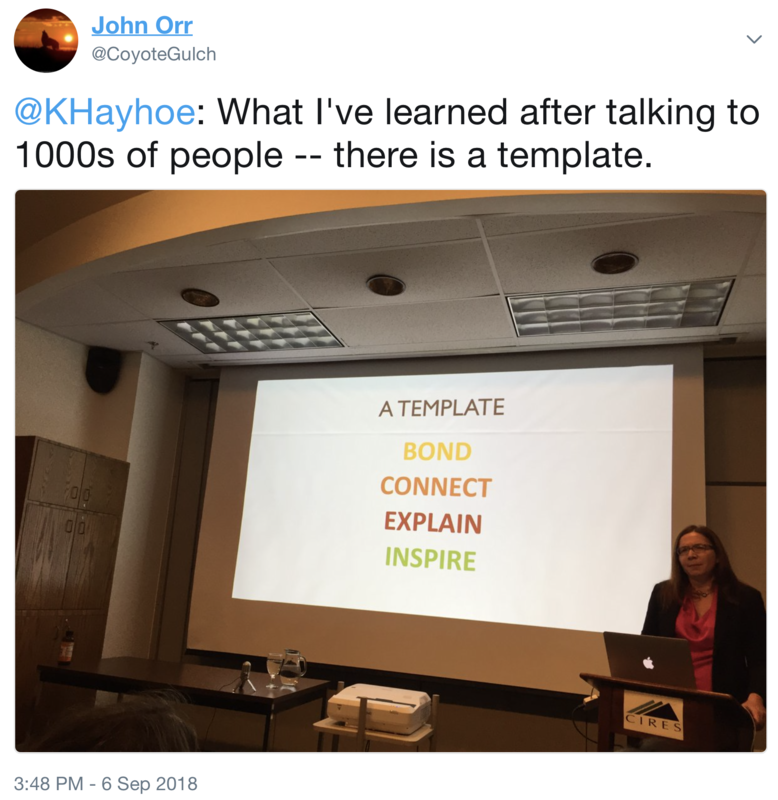 Below is her communication template. Thanks CIRES and Dr. Hayhoe for a great presentation. 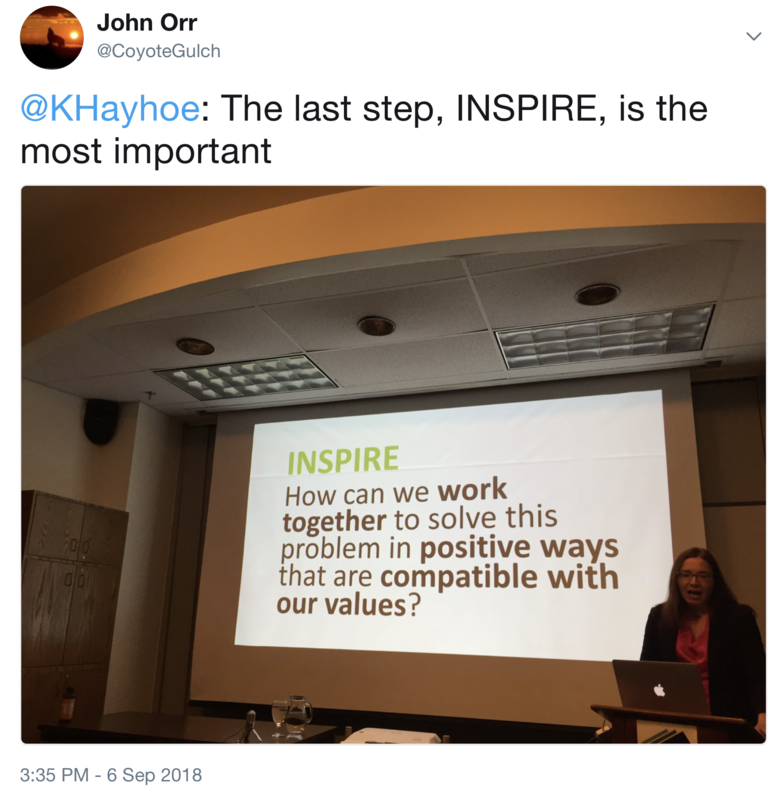 Note to Hayhoe: I left feeling inspired. Tomorrow is Rise for Climate with events all over the world. Acting on climate is essential as is voting for the environment.